I’ve had scary experiences snorkeling other parts of the world — such as getting swept away in a rip current in Huatulco, Mexico – so I’m extra cautious (OK, I’ll admit it – terrified) about swimming in the open ocean with a mask strapped to my face. But during my tour with Grenada Seafaris Powerboat Snorkeling Adventure I discovered that their unique mix of special equipment, safe snorkeling practices and stellar qualifications makes it possible for even the most timid swimmer to experience this incredible underwater attraction. 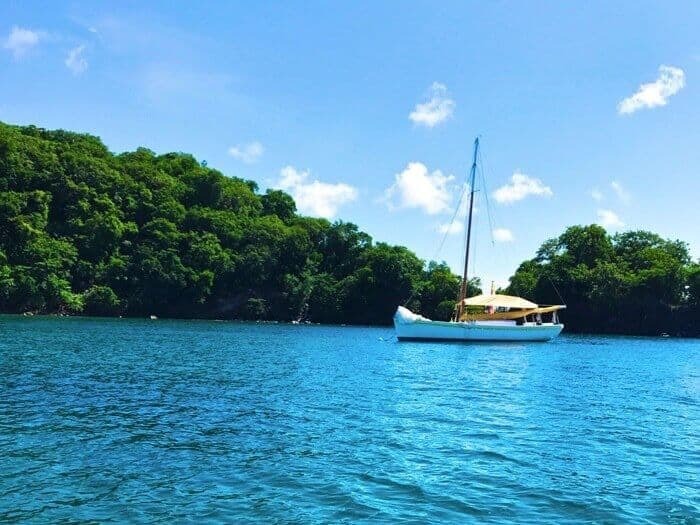 The Washington Post recently declared Grenada to be one of the world’s “10 hot destinations to travel to in 2018” and if you’re a food fan, it’s tempting to spend all of your time exploring cacao and spice plantations, eating artisanal chocolate, sipping rum at historic distilleries and sampling authentic Grenadian cuisine. But on a recent visit, I discovered that Grenada’s underwater attractions are just as fascinating as its food scene. And there’s no better place to begin exploring than at the Grenada Underwater Sculpture Park, the world’s first underwater sculpture museum and an innovative ecological marine project. Over the past few decades, we have lost over 40% of our natural coral reefs. The World Resources Institute projects that 90% of coral reefs will be in danger by 2030, and all of them by 2050. Created by British artist Jason deCaires Taylor in 2006, this underwater gallery features around 100 statues installed in the sand beneath the sea in Molinere Beausejour Marine Protected Area. Designed to help the ocean ecosystem regenerate after being damaged by Hurricane Ivan in 2004, the installation has grown to become a vibrant artificial reef draped with coral and teeming with marine life. The unique mix of art, marine science and activism is intended to help raise awareness about the fragility of the world’s environment and the destructive impact of industry and human habits. You don’t need to bounce across whitecaps in the open ocean to tour the Grenada’s Underwater Sculpture Park. 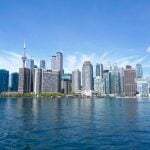 The main works of art are located in shallow water (a depth of 5 meters or 16 feet ) close to shore in Molinere Bay, just a 10-minute boat ride from St. George’s the capital city. 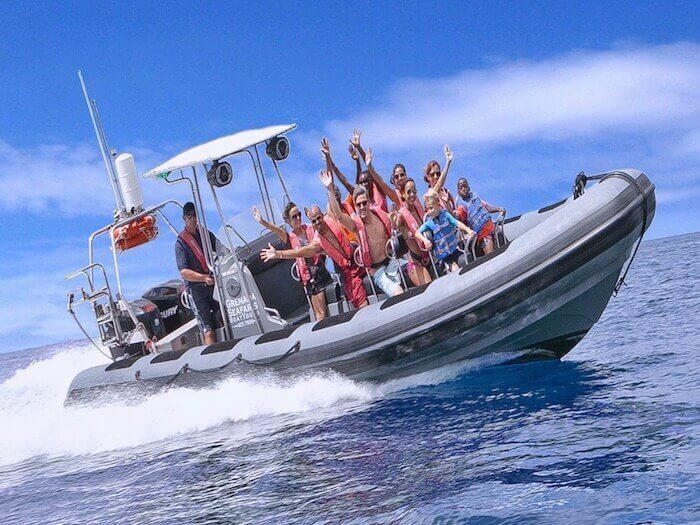 The Grenada Seafaris Powerboat Adventure departs from St. George’s harbour, where you board the the Seafaris Explorer, a 250 hp twin-engine rigid inflatable featuring unique saddle seats with handlebars. While the boat’s Zodiac-like shape may prompt you to feel as though you’re a Navy Seal about to embark on a rescue mission, the hobby-horse seats are actually quite comfortable and their height offers a prime vantage point for viewing the picturesque, horseshoe-shaped harbour. 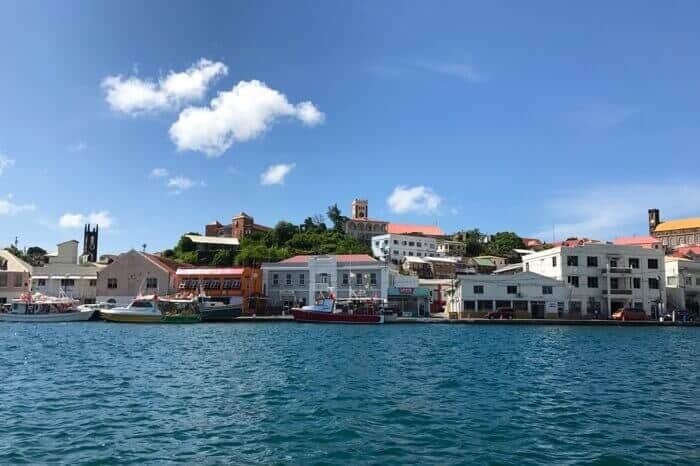 Founded by the French in 1650 and dotted with fishing boats, church spires, red-tiled rooftops and steep volcanic slopes, St. George’s is one of the prettiest harbours in the Caribbean. There’s no better way to appreciate its beauty than from the water where you can enjoy clear views of its historic buildings, Fort George (built in 1705) as well as Hospital Hill, once home to a Military Hospital and Cemetery Hill, the island’s largest and oldest graveyard, holding the remains of victims of yellow fever and cholera outbreaks in the 1700s. Although gliding past the southwest coastline at a quick speed, the boat ride itself is smooth and dry. It’s even possible to spot sea turtles, sea birds and other flora and fauna along the way. First, our group stopped at Dragon Bay for an orientation on the types of marine life to watch for. We then donned wristbands for admission to the Marine Protected Zone and entered Molinere Bay, home to the collection of underwater sculptures and the launching point for all Grenada Underwater Sculpture Park tours. 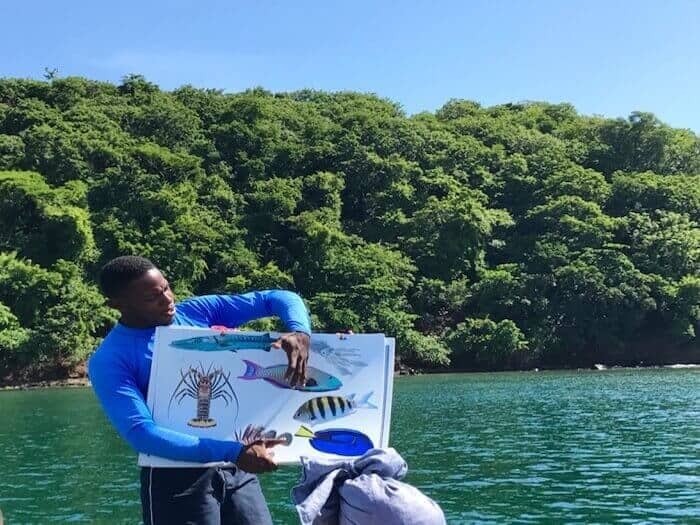 One of the features I appreciated during the Grenada Seafaris Powerboat Adventure was the boat’s custom-designed swim ladder for convenient access to and from the ocean. That meant I didn’t have to worry that once I got in the water, I wouldn’t be able to easily get back out. Participants can choose from two types of lifejackets, including special water-ski floatation vests for less confident swimmers. Snorkel masks and flippers are supplied. If you’re nervous about swimming with flippers, you’re not required to wear them. I actually have a prescription snorkel mask I take with me on travels so you’re also welcome to bring your own snorkel mask on this tour. Many people are also big fans of full face snorkel masks so it’s worth reading this guide to finding the best full face snorkel mask for tips on factors to consider. Other personal equipment to consider for a dive or snorkel trip include SPF protection clothing (rather than sunscreen which can damage the delicate marine ecosystem), travel snorkel fins, an underwater camera and a water resistant dive watch. 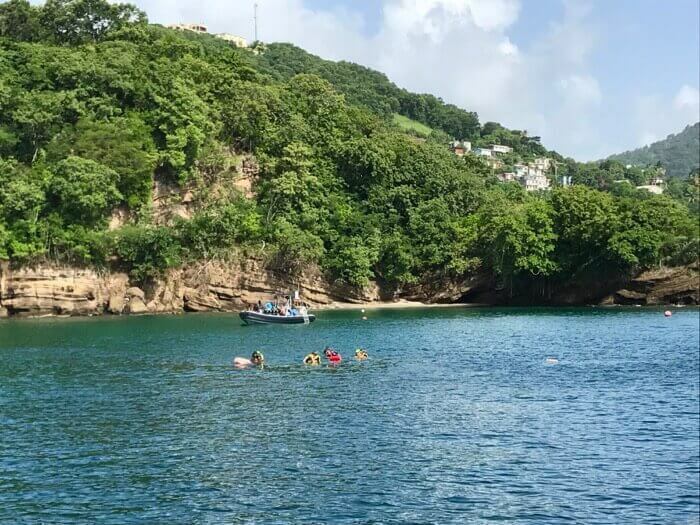 This tour of Grenada Underwater Sculpture Park is a guided tour led by a qualified guide who stays with the participants and chaperones them to each underwater attraction so they don’t miss a thing. Less confident swimmers have the option of floating with a life preserver attached to a rope held by the guide. In addition to the PADI & US Coast Guard Life Saving qualified crew, Seafari Explorer captain Howard Clarke stays onboard to monitor safety and water conditions. My own experience began as soon as I plunged off the ladder into cool, clear waters where I immediately came face to face with a blue parrot fish. The ocean floor was easily visible so it didn’t take long before I was comfortable floating behind our guide Kimmie as he led the way into the underwater park. The most striking of the first statues we encountered was Vicissitudes, an eerie circle of children holding hands with ghostly tendrils of algae floating from their bodies and manacled wrists. Their faces distorted by coral growth added to the mysterious quality of the encounter. 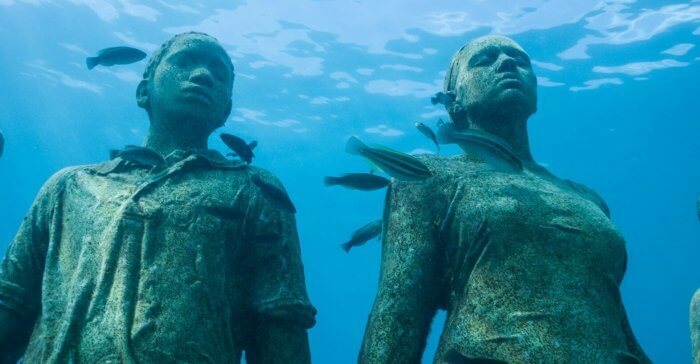 Although the original intent of artist Jason de Caires Taylor wasn’t a tribute to the African slaves thrown overboard during the Middle Passage, it does serve as a powerful reminder of the tragedy of slavery. Another highlights of the underwater art included The Lost Correspondent depicting a journalist working over a typewriter at his desk. The Underwater Park now features sculptures by other artists such as Lene Kilde of Norway who created the Nutmeg Princess, a poignant statue of a young girl with her arms raised in supplication. It’s based on a story by Grenadian Author Richardo Keens- Douglas. Strings of bubbles rising to the surface from the statue made it seem as though she was actually breathing. “It’s a legend about following your dreams,”explained our guide Kimmie, who had the strength of a Marvel superhero as he towed two of us by rope to the final few statues. The Grenada Underwater Sculpture Park is more than just a work of art or an underwater adventure. It’s a statement of environmental activism. Each of the statues is thought-provoking – each interacting with their marine environment in different ways. The installation is also environmentally responsible. Each sculpture has been created using rebar and non-toxic, pH-neutral marine cement, free from harmful pollutants. The rough texture of the statues encourages coral larvae to attach and thrive, while holes, nooks and cubbyholes provide habitat for fish, crustaceans and other marine life. The statues themselves are placed on barren seabeds away from natural coral reefs. 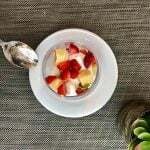 This helps preserve reefs already threatened by rising sea water levels, warming temperatures and acidity. 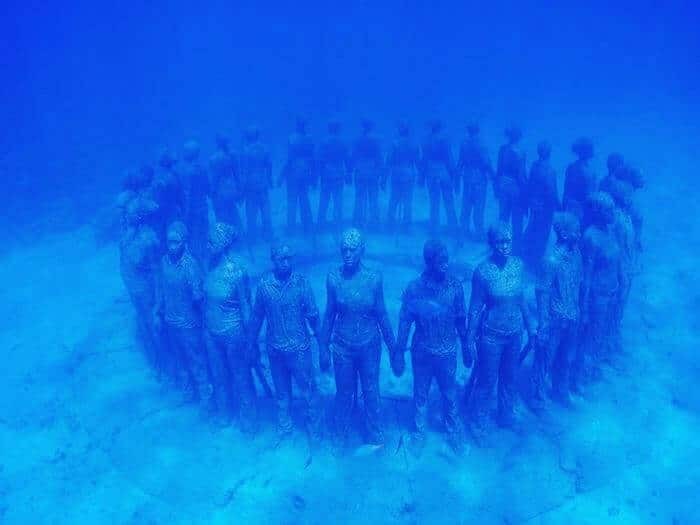 Although visitors can dive deep and explore the statues up close, it’s very easy to enjoy the wonder of the underwater park by simply floating on the surface of the water. It’s an every-changing slideshow of light, marine life and art you won’t soon forget. Hotel: The SOTIC conference was held at the Radisson Grenada Beach Resort which has the perfect combination of conference facilities and a prime location on Grand Anse Beach. My second floor pool view room came with a mini-fridge stocked with water, beer, soft drinks as well as a coffee maker. The AC worked like a powerhorse and the breakfast buffet featured fresh fruit as well as Grenadian specialities such as callaloo and sardines with sauteed onions. The beach was clean and very swimmable with beautiful, clear waters. I think every conference should feature a beach swim at the end of each day. Grenada Seafaris Snorkelling Tour: The snorkelling tour includes pick-up and drop-off at area hotels (If you’re staying at Sandals LaSource you book with Island Routes who handles the transfers) , the thrilling boat ride/tour of the coastline, entrance fee/permit to the Marine Protected Zone, snorkelling gear and life-vests, the guided Grenada Underwater Sculpture Park tour and bottled water. The depth of the water is up to 16 feet or 5 metres which means that if the visibility is clear you can see the sculptures without diving below the surface of the water. The 2.5 hour tour costs $75 per adult (half-price for children). Or, you can book a private charter for $650. They’ve also just launched a Bubbly Snorkel Adventure, a couples-only private charter with sparkling wine. Learn more at Grenada Seafaris Powerboat Tour or visit their Facebook page @GrenadaSeafaris. 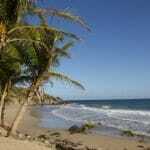 Pure Grenada: Visit the official Pure Grenada Tourism website for a wealth of handy travel information. i’ve been wanting to take a scuba diving course but i think i’ll wait until i go here because that would be an AMAZING first scuba diving experience. it’s definitely something you don’t hear about every day! Gorgeous photos! The Seafaris tour sounds like an extraordinary experience accessible by nearly everyone. The sculpture is stunning and all the more amazing for serving as an artificial reef. Kudos to Grenada for putting so much thought into creating such a beautiful and eco-friendly attraction. Thank you for the wonderful day on the water! And a special thank you to Kimmie for being such a great guide and making it possible for this fraidy cat swimmer to see this incredible underwater site. A cultural snorkel, that’s environmental, too. What’s not to like? What a unique concept. I’d love to see it. 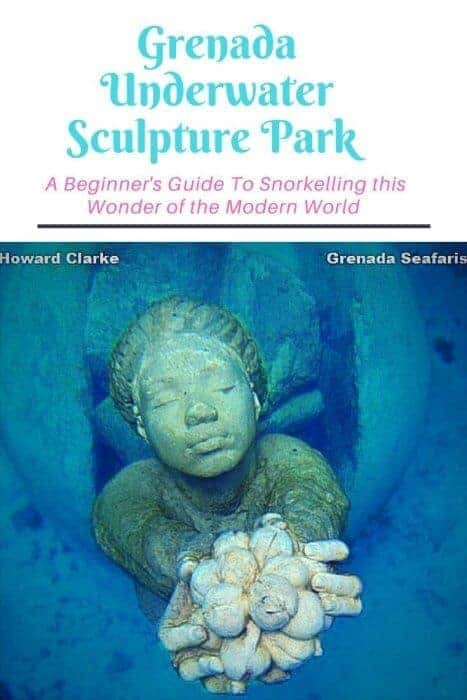 I never knew that Grenada had an underwater sculpture park. Not a diver, but if I was there, I would probably make an exception. Oh I went to Grenada years ago and never knew about this place! It is on my list. 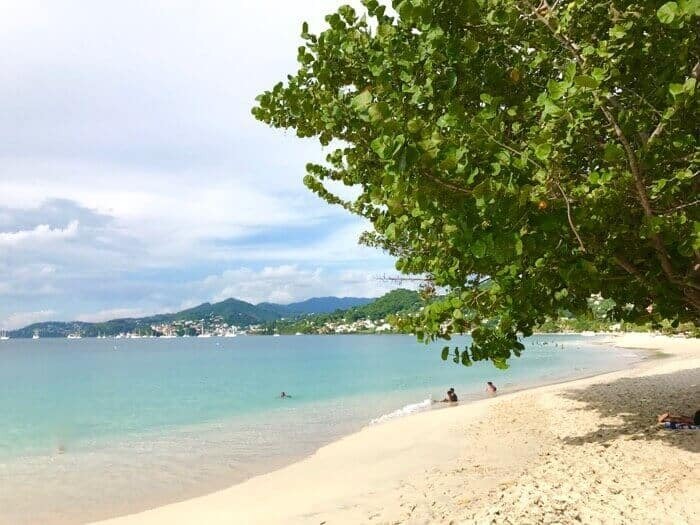 I have always wanted a reason to go back to Grenada and now I have one. Wow – what an amazingly creative way to restore the reef. I don’t know much about the Caribbean, so I was unsure where Grenada actually was. The tour you took sounded like just the thing for me. I love to snorkel off a beach in shallow-ish water, but I have real problems jumping off the back of a boat into deep water. This underwater sculpture park goes directly in the todo list for the Caribbean. I’d love to snorkel in Grenada but also to scuba dive and get a closer look! Didn’t even know this master piece existed! Thank you! I have to say I’m kinda scared of scuba but snorkeling is right up my alley. That sculpture park looks magificent. 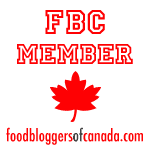 This is the first I’ve heard about the process of getting into the water and the eco-support for the ocean. I’d love to dive the eco-park one day. I really love these underwater sculpture gardens. I saw the one in Cancun many years ago and I fell in love with the idea. Oh cool. I’d heard about these underwater sculpture parks – including this one of course – but I’d assumed the only way to see them is by full on scuba diving, which is something I cant see myself ever mastering. Snorkelling I could definitely handle though.